Samantha L. Cho, DDS, FICOI came to the United States with her family and settled in Chicago in 1981 after fleeing Vietnam. After graduating from Lane Tech High School in Chicago in 1991, she attended the University of Illinois at Chicago and was accepted into the University of Illinois College of Dentistry in 1994. She graduated with a Doctor of Dental Surgery in 1998 and served in a post-graduate externship in 1998 in the Department of Oral and Maxillofacial Surgery at the University of Illinois College of Dentistry. Dr. Sam completed advanced training in periodontal surgery in 2003 and 2004 and completed her mastership in advanced implantology from the California Implant Institute/UNLV School of Dental Medicine in 2016. That same year, she completed the coveted International Congress of Oral Implantologists Fellowship which provides Dr. Sam with a worldwide standard of recognition for her clinical proficiency in implant dentistry. Dr. Sam is a fellow of the International Congress of Oral Implantologists and a member of the American Academy of Implant Dentistry, American Dental Association, Illinois State Dental Society and Chicago Dental Society. Dr. Sam enjoys family outings, traveling, reading, gardening, cooking and entertaining. 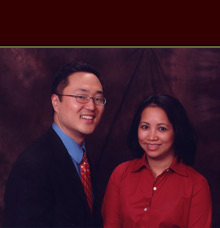 Theodore C. Cho, DDS was born in Chicago and was raised for much of his life in Hoffman Estates. After graduating from Barrington High School in 1991, he received a Bachelor of Arts degree in anthropology from the University of Michigan in 1995. He attended the University of Illinois College of Dentistry where he received a Bachelor of Science in Dentistry in 1997 and a Doctor of Dental Surgery in 1999. In 1999, he served in concurrent post-graduate externships in the Department of Endodontics and the Department of Radiology at the University of Illinois College of Dentistry. He is an associate fellow of the Academy of Gp Orthodontics and a member of the American Dental Association, Illinois State Dental Society and Chicago Dental Society. Dr. Ted enjoys family outings, traveling, reading, working out, eating Dr. Sam's culinary creations, and passionately follows Michigan Wolverines football, basketball and hockey. Drs. Ted and Sam have three young children, two daughters and a son.